Stock photos did a disservice to this car, so here's our attempt to give you a better look at it. Aftermarket tuner AC Schnitzer brought two hot Bimmers to the 2017 Geneva Motor Show to celebrate its 30th anniversary, but as the company quickly found out, one car proved to be a much bigger star than the other. That may be because the black paint job on the company’s M240i project was a bit too subdued for this show, even with its aftermarket body kit, but we’d argue that it has more to do with the fact that the i8 looks so much better than its coupe sibling. It quickly stole the attention of our photographer and held it until it was time to move onto the next booth, and for a good reason too. 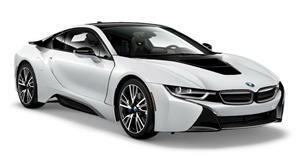 That’s because the futuristic and slightly polite looking i8 has gotten a makeover that helps coax out its angry side. Painted in a stunning shade of matte metallic red, the paint job contrasts nicely with carbon fiber trim pieces and aerodynamic bits, making this look like the perfect car for a crime fighter like Deadpool. At the front, AC Schnitzer lowered the car by 25 mm and brought the rear end down by 20 mm, effectively giving it a slight stance. This bodes well for the car’s looks, but it also brings the car lower, helping it corner more flatly and relocating its center of gravity to a lower point in the car. Stability is also improved thanks to aerodynamic additions, which include a front spoiler inlayed with carbon fiber, carbon side skirts, and and a large carbon fiber rear wing to top it off. There’s also a middle spoiler and a carbon hood top to compliment the front side wings. Custom wheels help further differentiate the AC Schnitzer BMW from the other i8s on the road and, in our humble opinion, help shed the polite personality that the slightly geeky wheels on the stock i8 give off. They are also original designs from AC Schnitzer, helping shed 9.7 pounds over the old wheels. While we saw this i8 when it was unveiled just a few weeks ago, this is one of those cars that must be seen in the metal to truly be enjoyed.